9-year old Tony, together with his parents, has just moved from the USA to a far-off part of the Scottish Highlands, where father Bob is supposed to build up a golf center for Lord McAshton. From this reason he doesn't have much time for his junior who cannot really cope with his new situation. Being a "Yankee" he is an outsider at school from the very beginning. At night he is tormented by nightmares in which vampires do their foul work. And finally, one night the vampire boy Rudolf, fleeing from the evil vampire hunter Rookery flutters into his room. Tony saves the little vampire and shows him where to find food, i.e. 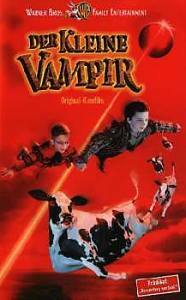 cow-blood (Rudolph's family hasn't been attacking humans for ages), and the two boys become friends. Tony gets to know Rudolph's Family and learns about the legend of the comet Attamo, who passes the moon every 300 years. Those vampires that hold up an old amulet, that somehow got lost, this very night turn back into humans. Tony already knows this amulet from his dreams.... but there's Rookery who doesn't make life easier for them. With the help of Tony's parents everything turns out well in the end and also the local cattle-breeder has reason to be happy. Some of you will surely wonder why we even put a film for kids in our list now. Well - the answer is easy: because we enjoyed it. Besides: in Vampireworld there's room for little vampires as well. .
Uli Edels movie cannot really keep up with the German-Canadian TV-series of the 80s where the great Gerd Fröbe was playing Rookery, but it still is a well-done film-adaptation of the well-known children's books by Angela Sommer-Bodenburg and is based on themes of several of her novels. What is special about her books is the change of the classic roles: the vampires are the sympathetic heroes, the vampire hunter, well-acted by Jim Carter, is the bogeyman. The only thing you got to do is to be open to this film and don't think from the beginning: "it's only a children's movie". That would be same thing as watching a really scary movie and thinking "it's only actors and ketchup" the whole time. Then it won't be any fun. But you really can have fun with "The little Vampire". And if the old series is ever repeated on TV: make sure not to miss it, even if it is only for nostalgic reasons.